We lost our last bunny right before Easter this year, a Flemish Giant named Jack. Looking to add another to our home, I incorrectly assumed that our county shelter would have a surplus of rabbits after the holiday. Instead I reconnected with someone I had gotten a bunny from in the past, a local magician who raises French Lops for his shows. 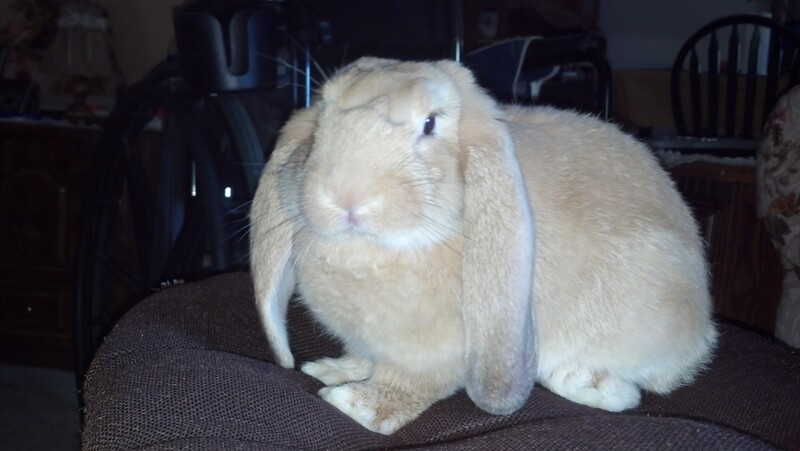 My previous French Lop, Cleo, was one of the best rabbits I ever had the privilege to love. On June 22 we brought home a two month old fawn Frenchie male. His parents were huge in size, and anticipating that our little guy may grow as big, we named him Rambo. His mother, Winnie, looked just like our Cleo, only a larger version, but the same chinchilla color. Rambo’s father, Joe, was equally huge, with broken fawn colored fur. Rambo is relatively small for now, but his body will eventually catch up to his large ears. It won’t be long before he is big enough to fill a magician’s top hat.